We’re halfway through 2010 now, and it’s time to see which motorcycles were most popular (or controversial) over the past six months. So here are the ten bikes that got the most hits and the most comments—and invariably ended up being featured on other motorcycling websites the world over. If you’re new here, you’ll get to see what we like—and if you’re a regular, it’s time for a second look. Enjoy Bike EXIF’s greatest hits! 1. 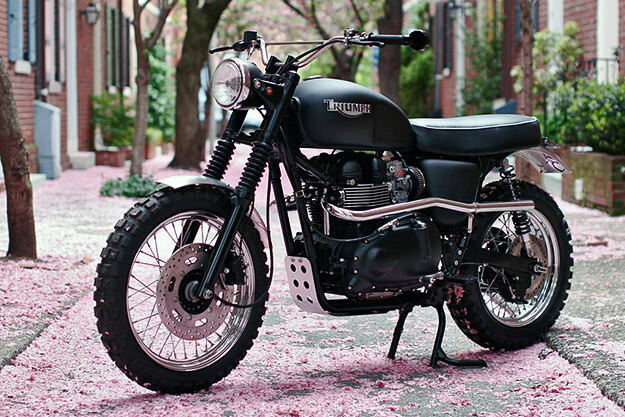 Hammarhead Jack Pine (Above) Readers loved this back-to-basics Triumph T100 Scrambler. 2. Ducati 750 Sport Mike Cecchini’s gorgeous resto-mod Desmo Special. Just … wow. 3. BMW R100/7 Scrambler Even the stateliest grand tourer can be turned into a scrambler. 4. Deus Triumph Bonneville Possibly the sexiest custom Triumph Bonneville in the world. 5. Falcon Kestrel An exclusive: the first studio shots of the world’s most beautiful custom. 6. Wrenchmonkees Honda CB750 This clean, simple ‘budget’ build sent hits off the scale. 7. Garage Company Customs CB750 Or what about this low and mean-looking CB ‘rat bike’? 8. Robb Handcrafted Cycles A 1969 Harley XLCH show bike, dripping with carbon fiber. 9. Icon Sheene The world’s most powerful production road bike—and the ugliest? 10. Triumph Speed Triple Custom Julian Schneider’s stunning Burt Munro tribute bike.